Get into the 2019 Buick Encore to experience a small luxury SUV that is big on features and versatility. 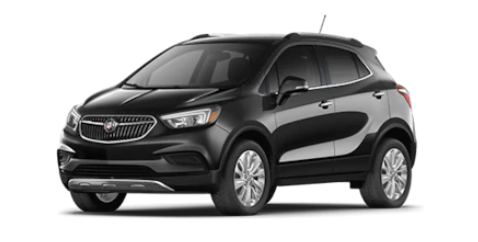 The latest iteration of Buick's smallest SUV boasts seating for five occupants plus an impressive 48.4 cubic feet of maximum cargo volume for hauling your gear. With its fuel-sipping turbo engine and well-laid-out interior, the 2019 Encore makes for a smart choice when looking for an agile yet luxurious new vehicle. Like other luxurious Buick models, the 2019 Encore comes standard with QuietTuning™ technology for a highly refined motoring experience, whether on the highway or city streets. When you add in the available driver-assist technologies like Rear Cross Traffic Alert, this agile SUV makes for the ideal urban cruiser, too! Shop and visit University Chevrolet Buick GMC for your chance to drive a new Buick Encore in Tuscumbia, AL. You can learn more about the full lineup of new Buick luxury vehicles here on our website or by visiting our dealership near Athens and Decatur, AL. Four well-appointed trim levels are available when you shop the 2019 Buick Encore, namely, the standard Encore, the Preferred, Sport Touring and Essence. Shop the Sport Touring for exclusive 18" alloy wheels and a rear integrated sport spoiler, fog lights up front and a convenient remote vehicle starter system. Leather-appointed seating highlight the range-topping Essence model, which also gets heated front seats and a heated, leather-wrapped steering wheel for those cool mornings and nights. University Chevrolet Buick GMC is your source for luxurious new Buick vehicles near Florence and Decatur, AL. With professional financing assistance and quality auto maintenance also available on-site, visit us for your complete automotive needs in the Tuscumbia, Alabama area.